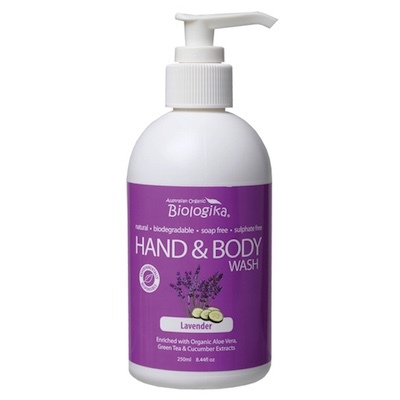 Hand & Body Wash Therapy range, Enriched with Organic Aloe Vera, Green Tea & Cucumber Extracts. Available in 1lt, 500ml and 250ml with pump. Organic Aloe Vera juice has been added for its soothing and healing properties, also known to stimulate cell regeneration and rich in vitamin E and C. - Organic Green Tea extract used for its wonderful antioxidant effectiveness, and Organic Cucumber extract is its refreshing and invigorating and it has the ability to remove impurities from the skin. A gentle formula for everyone to Enjoy!! Ingredients: purified water, organic aloe vera juice, biodynamic avocado oil, decyl glucoside, organic green tea extract, organic cucumber extract, coconut oil, xanthan gum, lavender pure essential oil, olive leaf extract, potassium sorbate and citrus seed extract.